The USS Rich Association is fraternal group comprised of former crew members and officers who served aboard the ship during her 32 years in service to our nation. The association, after being founded in 1994, became a 501(c)(19) non-profit incorporated in the State of Delaware on December 27, 2006. 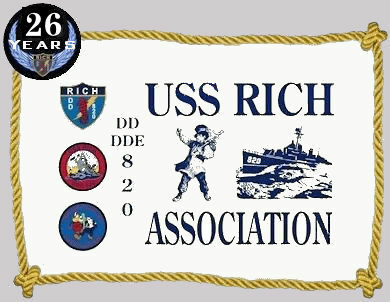 In addition to this extensive website and a quarterly newsletter, the Association sponsors a USS Rich Memorial aboard the floating museum, USS Joseph P. Kennedy, Jr. (DD950) at Battleship Cove in Fall River, Massachusetts. A memorial plaque has been placed at the Nimitz Museum in Fredricksburg, Texas. Members of the association have actively supported the maintenance and upkeep of the USS Laffey (DD724) by occasionally holding a Field Day aboard the ship. This highly-decorated Sumner-class destroyer is a floating museum located at Patriot's Point Naval and Maritime Museum in Mount Pleasant (Charleston), South Carolina. Additional volunteer efforts are conducted aboard the Laffey at various times throughout the year. 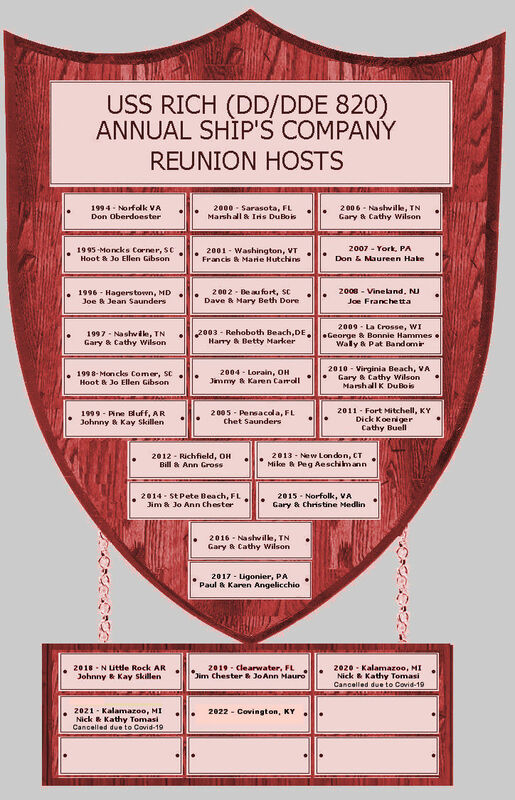 The highlight of membership is, of course, the annual Rich Reunion held each year at locations throughout the United States..
USS Rich Plank Owners and World War II veterans who served aboard the RICH are entitled to free Lifetime Membership..
You can Join or Renew ONLINE!